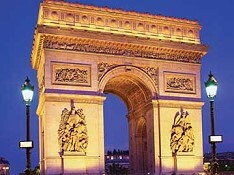 There is very little that we can share with our car rental clients about Paris that they don't already know. The Eiffel Tower is the world's most popular tourist destination. Then there is the Arc de Triomph, the Notre Dame Cathedral and, of course, the Louvre and Picasso museums. And if those aren't enough, you have the shops (Paris is the fashion capital of the world), the gardens, sidewalk cafes and the river Seine. For our Peugeot car lease clients we have 3 pickup locations in Paris. Auto France has been providing a unique long term car rental solution in Paris since 1991 in partnership with French auto manufacturer Peugeot. The Peugeot package by AutoFrance is a unique take on renting a car in Paris in that we provide a brand new (never driven) vehicle for every customer. We don't mean "Like new", it is quite literally from the factory floor. The vehicles are delivered to Paris Orly airport in advance of your arrival therefore the paperwork and arrangements must be done well before showing up to grab the keys. The result is nothing short of awesome when you arrive to ORY airport and are greeted with that new car smell after simply showing your passport and signing off. The entire process of picking up your car rental at Paris Orly airport is actually faster and easier than a regular car rental and you won’t be badgered at the counter by a sales rep trying to squeeze insurance coverage out of you. Have a peak at our Paris Orly airport PDF in advance, it outlines the procedures for picking up and returning vehicles to Paris ORY airport along with contact information and operating hours for the local agent. Be sure to call or email the agent at Paris ORY airport at least 1-2 days prior to returning your vehicle in order to allow them time to add you to their calendar and to ensure you understand the quick process of dropping off the keys securely.